Was there price cutting and/or commission cutting? My keys didn't even come in a plastic bag..........But the dealership did give me a bag with some decent Logo Key rings and a coffee mug. Woo Hoo!! 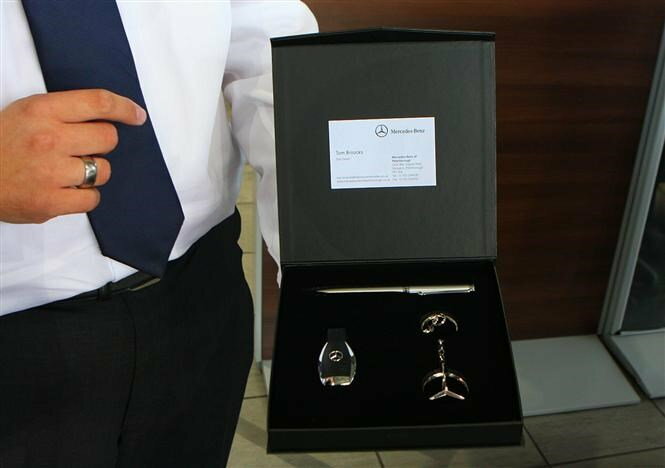 I had a similar presentation box with my 2013 C350. Not so much with my 2015 E350 or 2018 E400. When I picked up 2018 E400 directly from factory in Sindelfingen both keys were sealed in individual plastic bags. I guess that's how they come from production. The US dealer I purchased from gave me two leather key rings, and a carbon fiber pen, in a nice presentation box, like the one you show ... but all labelled with dealers logo. I'll never use them. For all my new cars it has only ever been the keys and a key ring. Wonder if the box was a dealer goodie bought and paid for by them. I've dealt with 3 different salesmen from the same dealership over the past 40+ years. I've gotten something different with each purchase from a leather MB travel bag to a leather passport wallet to a simple keyring. Whatever the gift, it is the gesture that counts. What did you do with the leather box? I would have thrown it away. This thread made me reminisce. This was my new car receipt. Even with this discount (I would only wish my enemy be on the other side of the negotiation table against me), I still had a nice box for my keys, a USB key, a MB pen and a whole slew of other useless stuff like keyrings. So maybe that's why there's no fancy boxes for everyone? Sorry? Last edited by superangrypenguin; 09-24-2018 at 05:19 PM. Too me it is truly amazing how car dealers manage to stay in business when all you hear from the salesmen is that on each sale they lost money! I am close to finalizing my order for my 2019 E450 sedan and with incentives the deal is coming at 10% off of MSRP. It is once again amazing how many dealers say that my dealer is losing money on the deal. Better get delivery fast: a few more deals like mine and they will declare bankruptcy. We may even have to take a collection for them! I can guarantee you that no dealer sells a car at a loss, with the exception being stale cars that they have in inventory for an extended period of time. Even end of year sales are not at a loss: they make it up with additional hold backs from the manufacturer! Will post details when I place the actual order.